Visitors to local ponds, rivers or coast lines often cross paths with one or more of the local turtle population. 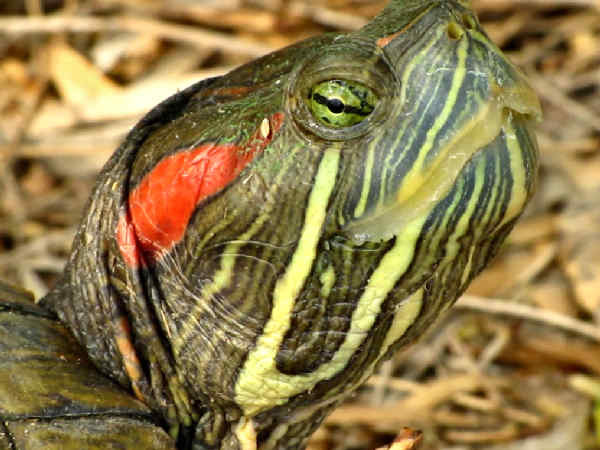 Due primarily to their popularity as pets, the Red-eared Slider in the top picture greets many pond visitors because pet owners have historically released them into local ponds. Their aggressive nature often translates into their pushing out local turtle species from their territory. Here’s a brief video clip of the same turtle in the top picture. It’s quite bold and not camera shy. When it comes to turtle counting, no one beats The Tortoise and Freshwater Turtle Specialist Group at the IUCN. Their recently published revised taxonomy of the types of turtles that inhabit much of the world consists of 454 separate turtles (317 species and 137 subspecies). Continued turtle research, especially with DNA analysis will alter the taxonomy and species numbers. Having said that, at the time of the writing, North American turtles formally consist of sixty six different species divided into seven families (including the sea turtles). Informally turtles also divide into three categories, fresh water turtles, tortoises (land turtles), and sea turtles or salt water turtles. By far, the majority of turtle species seen by the average American fits into the first category, fresh water turtles. The name might be a bit misleading because it also contains the box turtles, normally considered more a land based than water based group. Press the water turtles and box turtles buttons to learn more about them. Read more on this page to learn more about native turtle species from other turtle families. Four native tortoise species walk the North American soils. The least known and largest species, the Bolson tortoise (Gopherus flavomarginatus) inhabits high altitude areas of the a Chihuahuan desert in northern Mexico and areas of New Mexico and Arizona. Listed as endangered, efforts to protect its critical habitat have been established. The Texas Tortoise (Gopherus berlandieri), the smallest of the four native tortoise species, inhabits areas of northern Mexico and Southern Texas. Population declines led to its being designated a protected species in 1977. 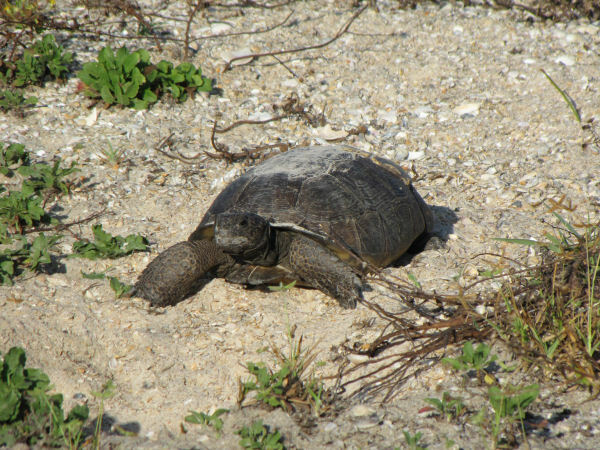 The Gopher Tortoise (Gopherus polyphemus), pictured, inhabits sandy soil areas in the Southeastern United States from Florida to the eastern parts of Louisiana. They live year round in large burrows, often measuring thirty feet in length. During the day they emerge to bask in the sun and forage for food, mostly plant life. The western population population are federally listed as threatened, with habitat loss cited as the cause of declining populations. Florida also lists them as threatened. Georgia designated them the official state reptile in 1989. The Desert Tortoise (Gopherus agassizii), a Southwest native species with distinct populations in the Mohave and Sonoran deserts. The Sonoran desert population tends to live along rocky hillsides, the Mohave desert population tends to live in flatland areas. The Mojave population has been listed as threatened. In October 2008 a couple of groups petitioned to have the Sonoran Desert population likewise listed, claiming that population levels have fallen by about 50% during the past twenty years. 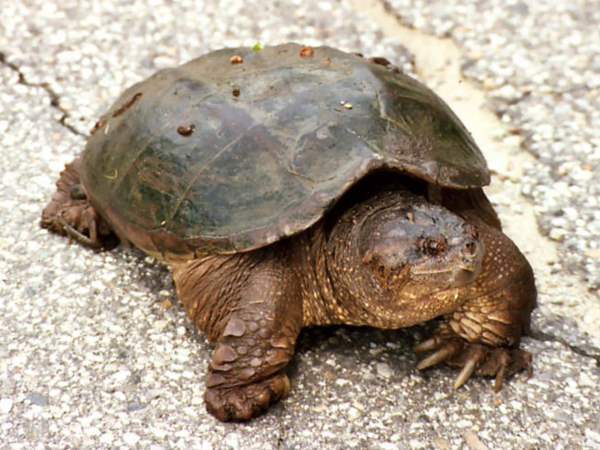 Two types of snapping turtles (family Chelydridae) inhabit the muddy water bottoms of ponds and streams across most of the Eastern United States: the Common snapping turtle (Chelydra serpentina) and the Alligator snapping turtles (Macrochelys). Common snapping turtles inhabit all types of fresh and brackish water environments east of the Rocky Mountains. Ponds, lakes, wetlands, creeks and even some rivers serve as home. As long as their is a muddy water bottom that provides them safety and a place for winter hibernation, it works for them. Apart from breeding season where they come ashore to lay eggs, they spend most of their lives buried in the river bottom, so seeing one in the wild can be a real treat. Adults in the picture have a flat shell. The Alligator snapping turtle holds the title of largest water turtle in the United States. When they say large, there’s really no comparison with the common snapping turtle. 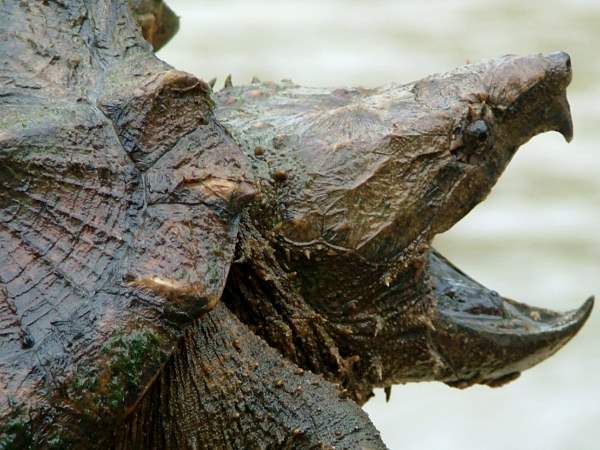 The average alligator snapping turtle grows about twice as large (almost three feet) and weighs around 175 pounds. Recently (2014) the genus was split into three species. They inhabit the river areas of the Southeast that empty into the Gulf of Mexico. Each of the river systems hosts a different species. In addition to size, the ridges on the shell make it easy to identify one in those rare cases it might come ashore. 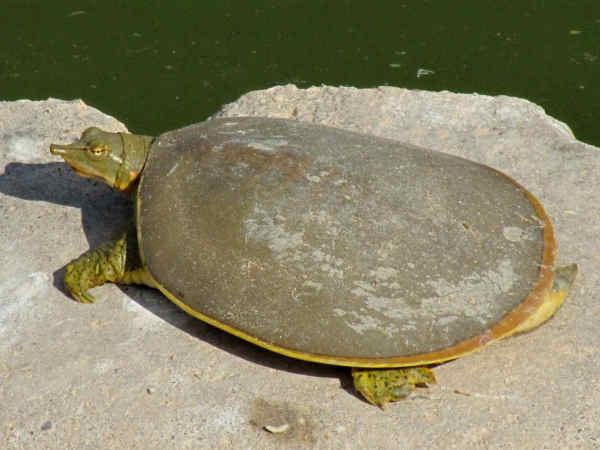 Three Soft-shelled turtle species (Trionychidae) along with multiple subspeciees, inhabit a variety of native water environments from rivers to ponds to drainage areas. In most instances, their large size, flat shells, pointed noses and propensity to bask in the sun, make them easy to spot and identify. They are omnivores that feed on a variety of local plant and animals within their territory. The white line on the face of the specimen in the picture indicates it’s a Smooth Softshell Turtle. 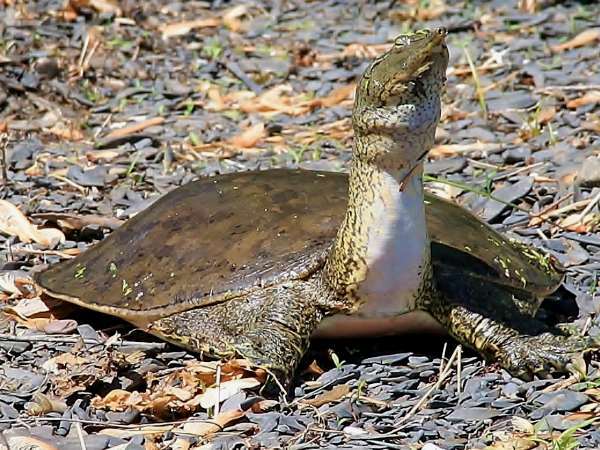 Here’s a picture of a Spiny Softshell turtle for comparison. Let’s talk about the types of turtles that fit into the family Kinosternidae, or the Mud and Musk turtles. Never heard of them you say? Never saw them you saw. That may be true. However, consider the following outline. Mud and Musk turtles are New World turtles, meaning they are only found in North and South America. There are eleven species in the United States, most of them inhabit the slow moving waters east of the Rocky Mountains. With only three species Musk turtles are the less common of the two groups in terms of species numbers. However their range extends to all potential areas east of the Rocky Mountains. Potential range is the key phrase. reaches in between historical sample sites. Data from those same sites in 2012 indicated a 32-56% chance of extinction in the historical sites… Coal mining and non-sustainable land management practices with related water quality and quantity threats continue to escalate.
. Populations for the other two species and subspecies continue to be sustainable. The name Musk turtle also refers to the odor they release as a chemical defense against predators. 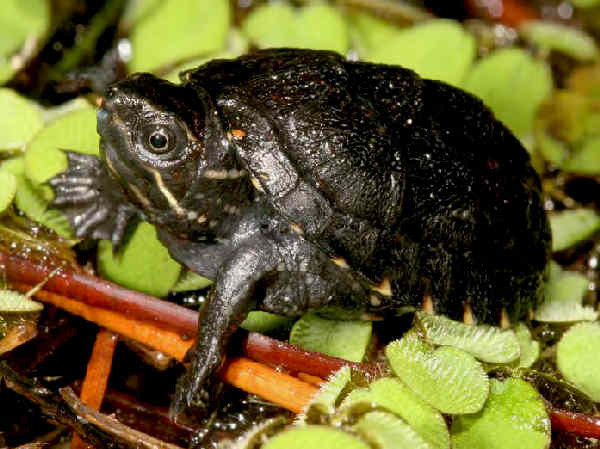 The picture shows a Common Musk Turtle. Note the high, smooth dome of the shell. 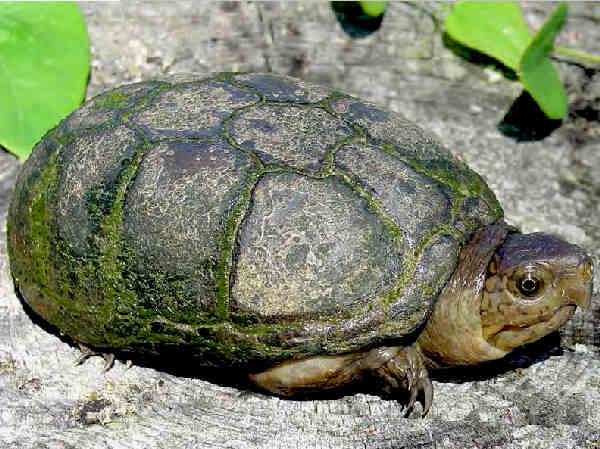 Seven species of mud turtles inhabit US waters. The Sonoyta Mud Turtle is the only species suffering from severe population pressure. In October 2017 it became the most recent turtle species listed as endangered in accordance with the Endangered Species Act. The name mud turtle pretty much explains the genera. They are small turtles that inhabit the muddy bottoms of water areas, again, mostly east of the Rocky Mountains. 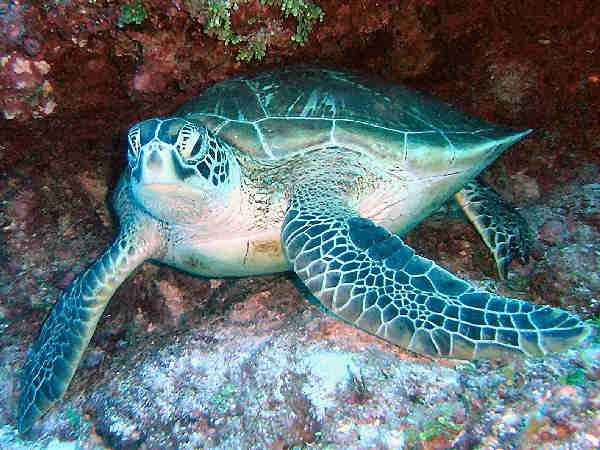 Seven different sea turtles live and breed in tropical and subtropical oceans of the world. With the exception of the Leatherback, they all grow hard shells. All seven species have experienced significant population declines over the last couple of decades, and all are considered either vulnerable or endangered. With the exception of the Flatback and Kemp’s Ridley turtles, sea turtles range extends across the world’s oceans. Their nesting grounds, the world’s beaches, share many similar characteristics. Habitat destruction or human encroachment in their traditional nesting grounds, along with increased fishing in their foraging areas, where they are accidentally captured as byproducts, and pollution are a few of the multiple factors that scientists cite as the primary factors contributing to their decline. Six of the world’s seven sea turtle species call beaches around the country their nesting homes. They fit into two different turtle families. Leatherback Sea Turtles (Dermochelys coriacea), the world’s largest marine turtles, easily reach lengths of over six feet long. The name leatherback aptly describes its most important physical characteristic. It is the only soft shell sea turtle, and it is also considered warm blooded, with the ability to regulate its body temperature during forays into colder ocean water. 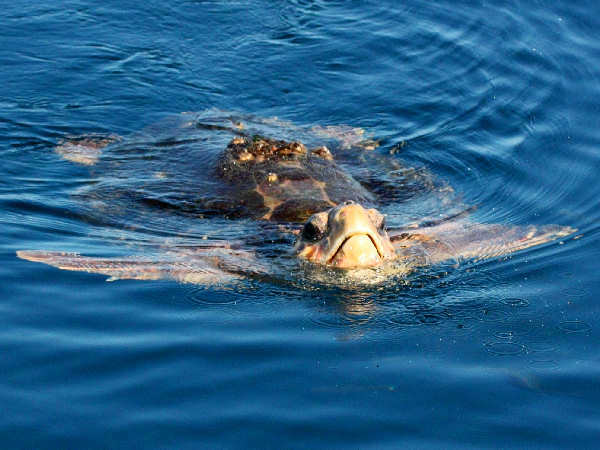 Loggerhead Sea Turtles (Caretta caretta), the most common sea turtle species found along North American coast lines, continue to experience population stress. While the south Atlantic coastal region and the Gulf of Mexico host most sea turtle nesting sites, several species do visit the West Coast.